Colorado is being sued by our neighbor to the south because the federal government created the Gold King Mine environmental disaster. Their argument goes something like this: Colorado is easier to blame, cause they are easier to sue than the federal government and we smell money. New Mexicans are taking their claim straight to the Supreme Court in Washington, just to show us they’re not fooling around about blaming us rather than Washington. For months, New Mexico has cried foul against Colorado and the Environmental Protection Agency, which caused the Gold King disaster in August, calling for someone to be held responsible. They don’t attribute that claim of responsibility, apparently, they just divined it. Attorney General Cynthia Coffman fired back stating that suing Colorado for something the EPA did, and admitted they did, only frustrates their mutual goal of forcing the EPA to essentially pay up for their crime. 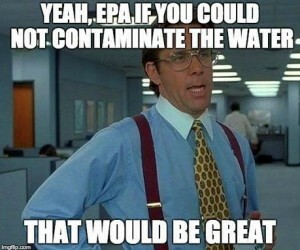 Not only that, but the EPA has a brand-spanking new excuse for continuing to refuse to hold those at the agency on the scene that day responsible — it’s in litigation. Thanks for nothing, New Mexico. Maybe we should just keep our own water in state, that would also solve the problem.